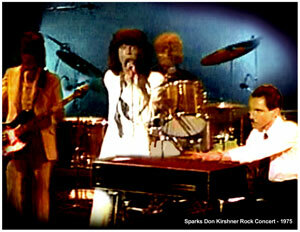 When Adrian Fisher was fired Sparks became a 5-piece group again. 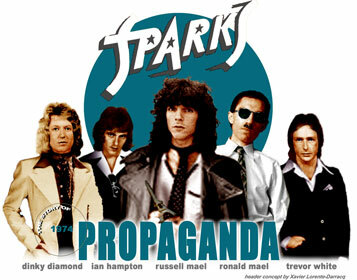 Sparks' "Propaganda" tour began at York on the 8th of November 1974, followed by 25 other gigs in the UK. Sparks' live performances caused mass audience hysteria. Walt Disney tunes were played before each gig, firing up teen audiences. The set-list included songs from "Kimono My House" & "Propaganda" LPs plus a rendition of "Girl From Germany" from Sparks' second album "A Woofer In Tweeters' Clothing" performed with a totally different intro. During the UK tour Sparks was supported by the scottish band, Pilot. Live, Russell Mael used his microphone like a wand and as he pranced around the stage, his brother Ron sat stoic at his lone RMI electric piano in mock concentration. One of the first concerts Sparks played outside the British Isles was in France. On the 30th of November 1974 the band played at the Olympia Theatre, Paris, then the Maels and the boys toured Netherlands, Belgium, Denmark, Sweden and Germany. But shortly after the "Propaganda" tour guitarist Adrian Fisher was too prominent in his opinion and wanted to have a saying in the direction of music that Sparks should go into. Adrian Fisher was still fond of playing rock/blues style and didn't really fit in with the band anymore. So the Maels fired their skilled guitarist and Sparks became a five-piece group again. Joseph Fleury, fan club secretary and later Sparks manager : "Things were getting really difficult with guitarist Adrian Fisher. He hated the band, he hated the music, he was simply in it for the money. So Ron Mael and Russell Mael were looking someone and it looked for a while as though Ian North from american band Milk n' Cookies might be suitable, but he proved otherwise." (from "Glam Rock" by Dave Thompson, 1996). Propaganda was released in America in January of 1975 and reached #63 in US charts. The single "Achoo" b/w "Something For The Girl With Everything”, was launched to conquer the North American market and the band soon appeared in a barrage of television appearances. 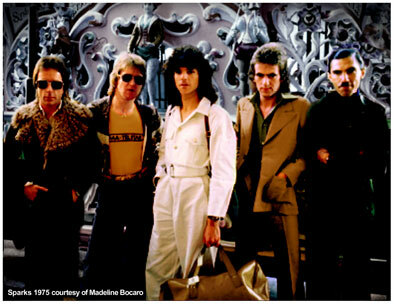 Sparks did NBC’s "Midnight Special" and "ABC’s In Concert" where they were introduced by Who's drummer Keith Moon and Ringo Starr (formerly with the Rolling Stones) and the band caught the attention of many new fans.